Icicle Tricycles built this custom cedar box Ice Cream Bike for Tin Pot Ice Cream & Frozen Treats. This Ice Cream Bike has a custom box and carefully stencilled graphics. Check out the Be Here Now Ice Cream Bike! One of our dark blue Icicle Tricycle Ice Cream Bikes with custom painted panels by Mike Force. Inspired (and inked!) by the Big Cone in the Sky of Baba Ram Dass, the “Be Here Now Ice Cream Bike” is bringing you frozen treats in the street despite the heat! Public Hotel Chicago’s Icicle Tricycle Ice Cream Bike! PUBLIC Hotel Chicago has deployed an Icicle Tricycle onto the beaches and streets of Chicago! Stocked with cold treats, the Ice Cream Bike brings smiles all over town! Shaka Pops Icicle Tricycle Pedals Ice Cream in Hawaii! Icicle Tricycles was stoked to help Shaka Pops get their business rolling! As always, we were happy to share our advice and personal experience running our Icicle Tricycles to help them get started. These gourmet Shaka Pops are available from their custom branded Icicle Tricycle Ice Cream Bikes! You can find these cool pops and beautiful Ice Cream Bikes at farmer’s markets, events, parades, and anywhere in Hawaii needing refreshing treats! Icicle Tricycles sends a big Aloha to this Hawaiian fleet of gourmet ice cream bikes! Umpqua Bank Advertising Tricycle, a photo by portlandpedalworks on Flickr. Icicle Tricycles worked with Umpqua Bank, a local community bank to build them a custom wrapped Ice Cream Bike. 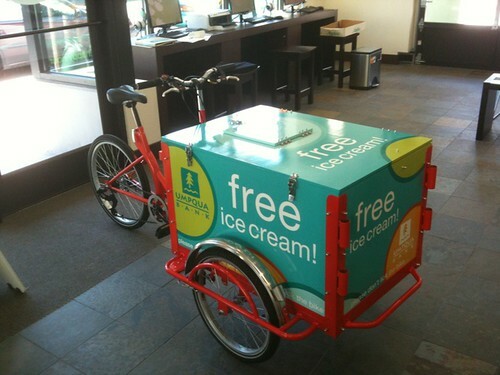 Umpqua Bank deploys their marketing bike to provide ice cream treats at local events. They have brought their custom Umpqua Bank Ice Cream Bike to many of their branches throughout the NW. Everyone loves a free ice cream treat! Here is some of our Icicle Tricycle Ice Cream Bikes for sale. these are our current standard colors. We can do custom powdercoats with additional time and expense. These are photos of our current Ice Cream Bike for sale. Please contact us with any questions! We are always happy to help get folks rolling! Icicle Tricycles built a recent fleet of Product Sampling Bikes for a customer. They wanted to the boxes match their company colors. These product sampling bikes are going to be rolling through many neighbourhoods! Heineken USA had Icicle Tricycles build them some custom beer marketing bikes! These advertising bikes gather attention everywhere they go! All of the design and graphics was custom work to make these Icicle Tricycle advertising bikes look great! Icicle Tricycle Ice Cream Bike with custom graphics for marketing and ice cream sales!